Lucille’s Smokehouse Bar-B-Que Executive Chef Chris Ferrell has more than 25 years of culinary experience. Chris started cooking and fell in love with food at an early age working in his family’s restaurant. At the age of 19, he moved to San Francisco to further his culinary career, and there received his first taste of a high-volume, BBQ experience at Macarthur Park restaurant, a pit BBQ concept with a regional American flair. Chris then went on to the California Café in Corte Madera and San Jose, California. Chris’ next major stop was as Executive Chef for Engine Company 28, an American bistro style restaurant located in an historical landmark in downtown Los Angeles. Chris was then recruited by the Cheesecake Factory, where he worked in several, high-volume locations in Southern California and on the East Coast. 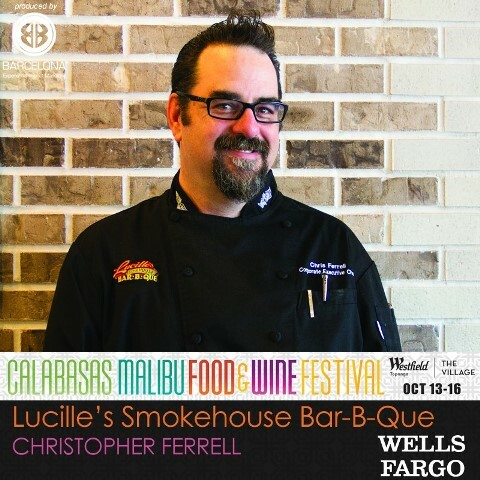 Chris was approached by restaurateur Craig Hofman and began discussions and ideation for a new authentic Southern-style, Bar-B-Que concept, which became the popular Lucille’s Smokehouse Bar-B-Que chain. Here, Chris was able to explore his real passion for authentic BBQ and its primal, mouth-watering flavors that can only come from true, low and slow BBQ techniques. As Executive Chef, Chris spent an entire year developing the signature sauces and recipes, and in 1999, the first Lucille’s opened in Long Beach, Calif. Today, there are 22 Lucille’s in California, Nevada and Arizona. Chris` current responsibilities include all menu development, culinary operations, purchasing, new location openings, development of kitchen management and training programs, and marketing and brand development.